Summary Ubicom-based "N900" router with Atheros radios, seven Gigabit LAN ports, USB printer and file sharing. 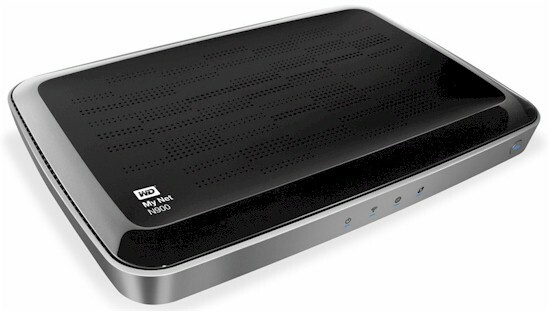 WD has discontinued its networking product line as of early 2014. WD has bravely entered the highly competitive consumer router arena, with its four-member My Net HD Dual-Band router family. WD sent the penultimate member of the new lineup, the N900, in for review, so let's get started. One of the N900's key competitive differentiations is the seven switched Gigabit Ethernet ports arrayed across its rather broad rear panel as shown in the graphic below. Note too, the dual USB 2.0 ports for storage and printer sharing. The latter, however, requires installation of Windows-only WD Print Share software. The front panel contains a WPS button and handy status/activity LEDs. I covered the internals of the the N900 in this Inside Story article, which I've updated with corrected component information. I also took the RF shields off after testing and snapped the photo below, which clearly shows a Ubicom IP8260U processor. For quick reference, here is the updated table, with comparison to the similarly-designed D-Link DIR-857.